The Digital India vision provides the intensified impetus for momentum and progress for e-Governance initiatives and to meet this vision, it is required to build adequate and relevant capacities at all levels. People, who are expected to design and deliver projects under Digital India, need to be trained in relevant areas. 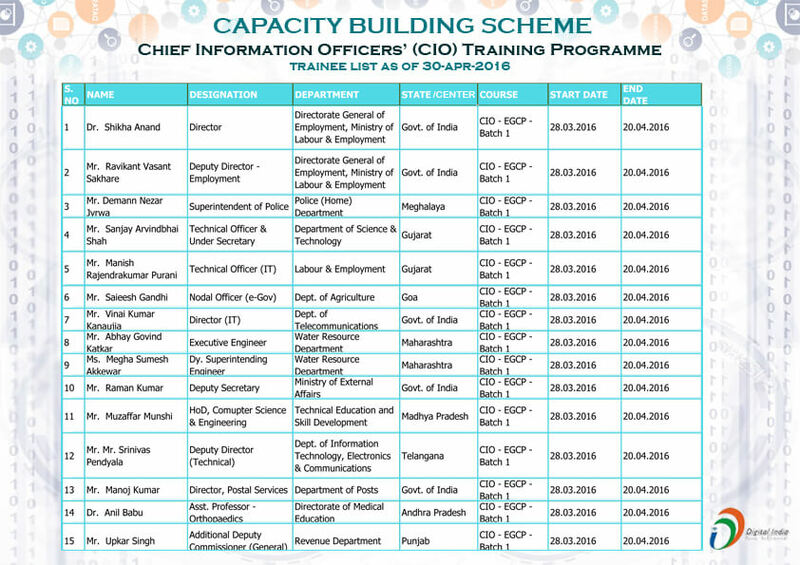 Capacity Building Scheme (CB Scheme) is an initiative towards this objective. The scheme aims at providing technical and professional support to State level policy and decision making bodies and to develop specialized skills for e-Governance both at Central Line Ministries and State/UTs. The CIO programmes aim to create e-Governance Champions within Line Ministries/Departments (both at the centre and states), who will lead or implement the MMPs under NeGP or other e-Governance projects. The CIO programmes also help them understand basic elements to complex issues pertaining to e-Governance project execution. The objective is also to accelerate implementation of e-governance initiatives in India across all levels of government. e-Governance Leadership Programme (eGLP) : 2 week programme for Senior Officials from central and state government (of the level of Joint Secretary in the centre, and Principal Secretary in states/UTs). A Highlight of the programme is the international best practices (IPB) component. e-Governance Champions Programme (eGCP) : 3.5 week programme for Officers at the 2IC level involved in project implementation (central & state government). A Highlight of the programme is the international best practices (IPB) component. 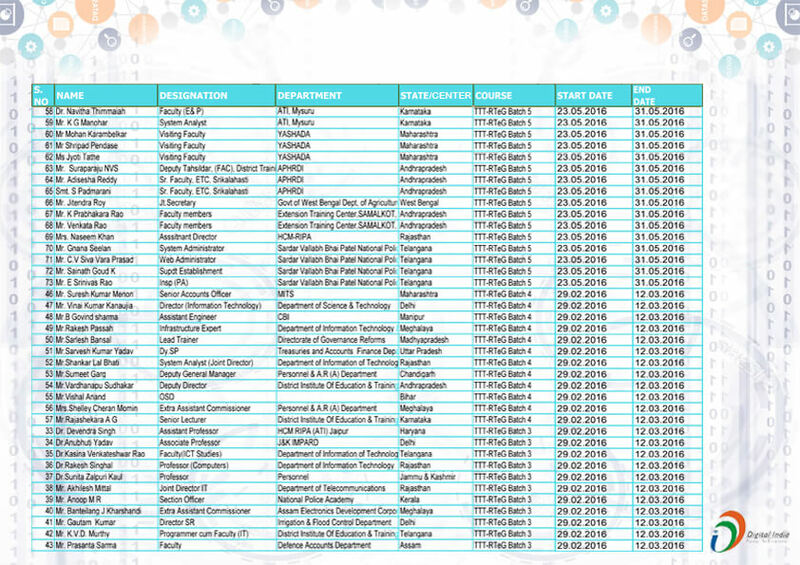 e-Governance Executive Programme (eGEP) : 4 week programme for Officers at the implementation level involved in project implementation (central & state government). A Highlight of the programme is the international best practices (IPB) component. The Specialized Training for e-Governance Programme or “STeP” is primarily targeted at senior and middle management (including Principal Secretary, Secretary, Commissioner, Additional Secretary, Joint Secretary, District Collector, Director, Joint Director, Additional Director). These training programmes aims to develop skills within state government departments in specific areas such as government process reengineering, business models, public private partnerships, project management, regulatory frameworks, technology management, etc. The duration varies from 2 to 5 days depending on the target participants and course. The Thematic Workshops aim to enhance the awareness and understanding of issues relating to various themes and processes of e-Government Projects. The workshop also familiarizes the participants with standards, guidelines and Best Practices of respective themes. It also provides a platform to encourage cross learning among the participants representing various states. 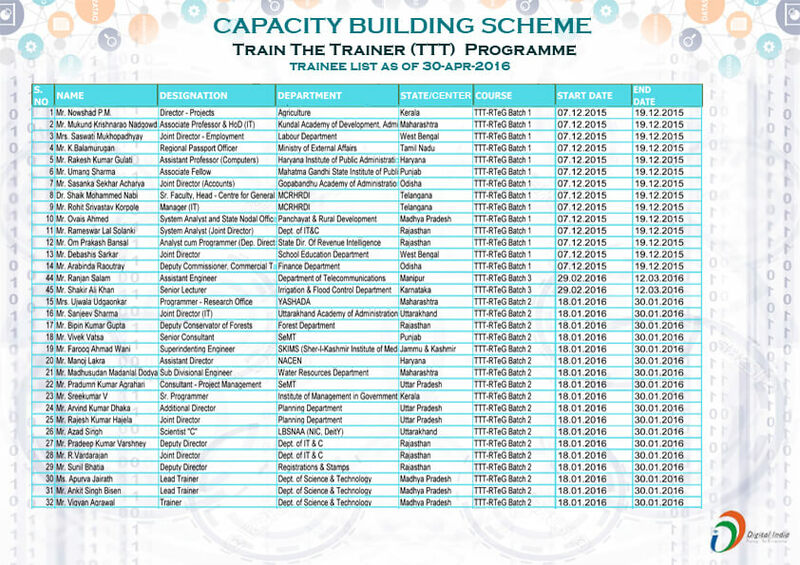 The Train The Trainer (TTT) programmes aims to create and enhance a pool of expert trainers whose expertise can be used by the Central and State/UT Governments for their e-Governance training programmes. It also standardizes the delivery of content; ensure that a comprehensive and quality facilitation of e-Governance lifecycle is delivered across the country through multiple training programmes. Digital India sets pace for a makeover that shall change the face of the entire nation, impacting cities, towns, villages and more. This change is possible only when all communities are involved in the e-Governance project implementation in a structured and professional manner. 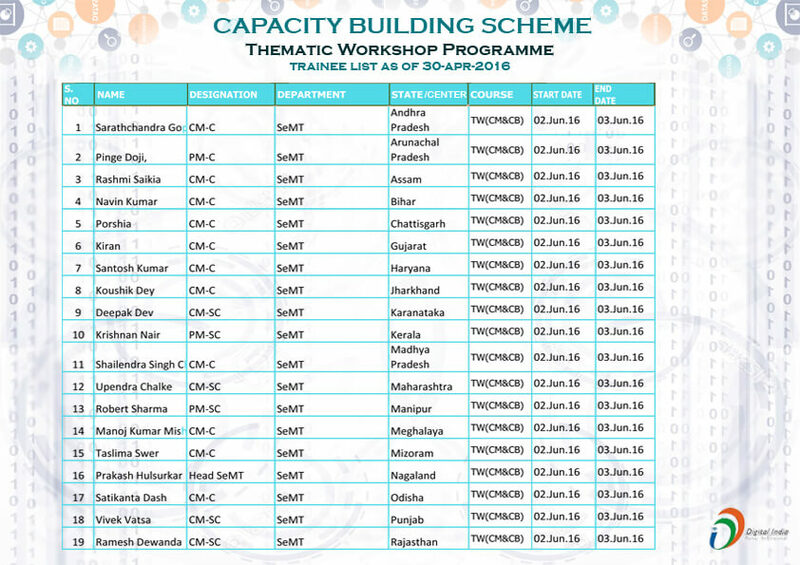 Given the need for trained e-Governance professionals in the country, especially among the Government officials belonging to SC/ST category and general category officers who are working in TSP areas, the Government of India initiated a programme exclusively on e-Governance Project Management. Project Management assumes paramount importance at all levels and cross sections of e-Governance Projects. The e-Governance Project Management programme is aimed to impart project management skills to SC/ST Officers and Officers of TSP area, at State and district level from conceptualization to rollout stage of an e-Governance project. SeMT programmes aims to disseminate the knowledge about e-Governance and its components among the participants and sensitize them for their possible contribution. It is being a part of ambitious mission of comprehending the god governance, enabled by e-Governance. To provide an idea of functioning in a Government setup and equip them with the basic processes/procedures/protocols for documentation, internal/external communication/approvals. Acquaint the participants with hands on information on various components, policies, guidelines and initiatives under various MMP’s of National e-Governance Plan.